One of the regular hoaxes, that seems to have a life of its own, involves Facebook charging users a service fee for its services. 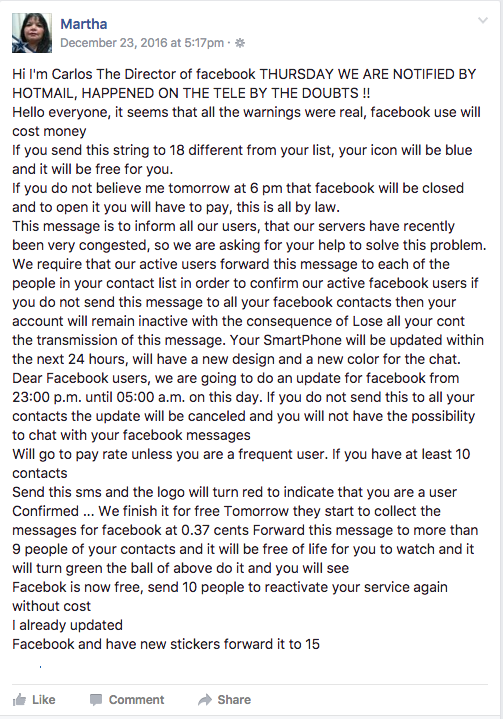 There are 1000s (seriously) of variations, but overall the hoax says that unless you share, or send the following post to ….. number of your friends that Facebook will start disabling accounts, and will charge to have those accounts re-enable. Well it seems we have a new version of this hoax making the rounds on Facebook. AGAIN LET ME BE CLEAR, IF YOU SEE THIS POST ON FACEBOOK, ITS A HOAX. As you read the message, if you noticed, the grammar makes you say HUH! and the post verbiage itself seems to be all over the place. Oh and one more thing, who is this said Carlos that is the director of Facebook. Is Carlos the secret identity of Mark Zuckerberg? Just remember, a site like Facebook has over 1 billion users worldwide. I’m fairly confident that if they ever decide to charge for their services that you would see reports in news organizations all over the world. When you see hoaxes like these, it’s best if you do NOT participate, so DON’T SHARE IT! Also if you know others who are sharing it, make sure to tell them that it’s a HOAX, so they can remove it from their timelines.